Since I started teaching, students have had problems with homework – either getting it wrong … or not doing it at all! Students have homework diaries or planners but those students who need most help don’t fill them in properly or forget them. One solution is to use a VLE but for many staff the VLE has too many features for them and is too complex or not fit for purpose. I started writing plannerLIVE! five years ago after using a message board for online homework in a previous school. In those five years I have made improvements and have now released brand new features that make it a brilliant tool for any school to use for homework. The best thing is that it is completely FREE! The main guiding principles for plannerLIVE! were that it MUST be EASY for any teacher to use and there shouldn’t be any barriers for parents or students. As a result we don’t force parents or students to log-in and they can search the homework database without worrying about forgetting passwords (which can be a support nightmare for schools). Searching homework is incredibly easy for students or parents to use. There are a number of drop down boxes and they can choose as many or few search criteria as they want. Homework automatically disappears from the search listings when it expires so if users want to find a homework that they haven’t handed in they can click the “Search Past Assignments” to find old assignments. Adding homework to the system has to be easy and I genuinely haven’t met any teachers who can’t use the system … it’s THAT EASY! You fill in the form and it’s automagically added to the main search listings. The teacher doesn’t need to do anything else to make it happen. 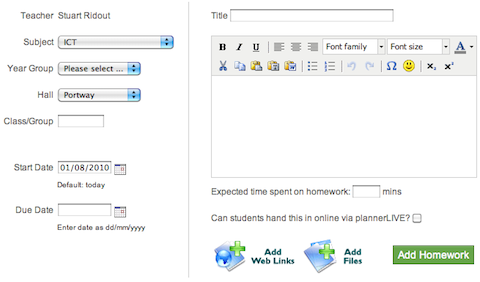 You can also add web links or upload worksheets into the homework page by using the relevant buttons. One of the main aims for plannerLIVE! was to save teacher time. Teachers are incredibly busy with more pressure being put on them to raise improvement. 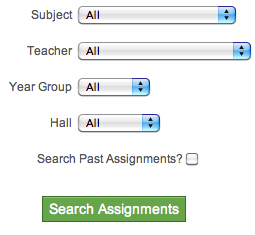 The Curriculum Library feature allows you to share and re-use homework assignments from other teachers. This allows the spreading of best practice and save you time! Last summer we introduced new features so students could register and are able to hand-in homework online or ask questions about the homework by sending a message to the teacher. Now we have hundreds of pieces of work handed in online. One of the features we were asked for a lot was a management overview of the homework showing what homework had been assigned and when by different members of staff. We have now rolled out this feature on plannerLIVE! and members of staff who have been given the correct access rights can view a breakdown by subject or staff. By clicking the relevant number, you can view the homework that has been set in a particular month by any individual member of staff or in a subject. Schools have now got complete control over these sub-groupings and can name them to ensure minimal confusion for users. The best thing about plannerLIVE! is that it is completely FREE! No restrictions, no limits. Schools can register and start using the system immediately.